Feel like you need to step your bass playing up a notch? You're not alone. Progression is the constant challenge facing every musician, but with these six practice methods, you can efficiently work towards better bass playing sooner than later. The number-one thing you can do to become a better musician is transcribe! For any who don't know, transcribing is the process of listening to a track and figuring out how to play a certain part by ear. This also typically involves notating the part as sheet music. When you sit down with your instrument and learn a part by ear, you're exercising not just one, but many crucial musical functions. Most importantly, you're using your ears to figure out what notes to play and everything else about them. Use your musicality to its full extent. Try to hear the nuances of the part being played and replicate the original performance to the very best of your ability. Transcribing isn't easy in the beginning, but it gets easier with time, and it should be just as fun as it is productive. Diving into your favorite music and learning to play the parts should give you that warm, rewarding feeling inside that only comes from real progress. After you've learned your part, take it to the next level and learn the other instruments' parts, too. 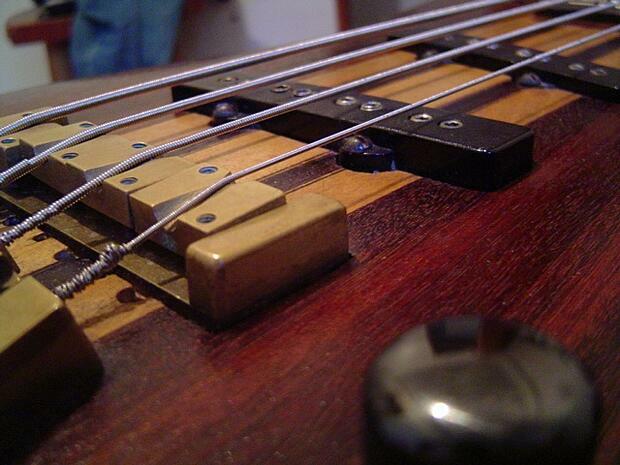 The foundation of any bass player's credibility is his or her sense of time and consistency. What better way to flex these chops than by practicing with a metronome? Before you even turn on the metronome, though, take a second to get yourself in the zone. Sit down and take a few deep breaths before you pick up your instrument. Then, after you pick up your instrument, take another quick second to make sure your mind is an absolute blank slate, ready to lock into the beat. Turn on the metronome, and take some time to feel the tempo before you start playing. Seeing a pattern yet with the pacing of this endeavor? Try your best never to rush into a practice with a metronome; you'll just waste time and energy. You'll most likely still fumble even if you take it slow, but a mindful thought space will minimize missteps when practicing with a metronome. This is yet another meat-and-potatoes aspect of practice. While scrutiny over detail and minimalist zen practices are important, it's also important to take a walk on the maximalist side of life on occasion. Push your limits by finding a passage that you can just barely finger on your instrument and play it over and over again. Remember to start slow in the beginning and make sure you're actually nailing it. Don't rush this process; take as long as you need. At this point, most people will tell you to slowly build up the speed of the run, but I had a teacher who taught me differently. He taught me to start slow, but instead of gradually building up to the goal tempo after you've nailed it slow, take it right up to speed (at your desired tempo). This practice is common in classical music, and it can help you out with many a tricky passage. You just got a nugget from the world of classical music; now for a simple, common trick from the jazz world. Next time you're learning a part, try singing the notes of the part as you play them. By singing the notes you play, you're engaging with the music on a whole other kinesthetic level of learning. The rhythm and the melody get under your fingers that much easier once you get it under your tongue. Don't get discouraged if you fumble – it's a lot harder than it sounds! Bassists, this should not be the first time you're hearing about F. Simandl's New Method for the Double Bass. This book is, front-to-back, the bible of classical bass method. While it's primarily intended for the upright bass, this orange paperback treasure chest will also teach you to read and play music on the electric bass in the most proper way possible. This resource can be incredibly helpful for young, self-taught bassists looking to avoid forming any bad habits, but even if you're a seasoned bass player, you can't go wrong cracking open a copy of the Simandl method. Once you know what you're playing, it's the fine-tuning that really makes the difference between a good performance and a great one. So much of the control a bassist has over his or her instrument comes from the initial source of the sound – how the string is physically struck. By manipulating the attack with which the note is played, you can dramatically alter your sound. Practice striking a note until you get a sound that you like, and then practice getting that sound to be consistent. The ability to play a song with appropriate dynamics, or, more difficult yet, to loop a riff for a few minutes at a time at the same dynamic, is an invaluable skill. Be patient with yourself when practicing. High-quality playing doesn't come overnight, but the quickest way to get there is with consistent, focused practice. Max Monahan is a bassist and a writer living in Los Angeles. He spends his time working for an audio licensing website and shredding sweet bass riffs.